Endings. Every story has one, but not every story has a good one. What makes some of them work and the rest of them fail? Well, let’s take a look at them. Resolved, positive: not only are the major problems solved, but the protagonist comes out ahead. A good example of this that I just watched was Penelope. It’s the story of a cursed girl born with a pig’s nose who thinks she must find an aristocratic mate to break her curse. But her real problems–her lack of knowledge of the real world, inability to function outside her cloistered existence, difficult relationship with her mother, and forced low self esteem–are actually all resolved through her own hard work. Also, a romance with a commoner becomes possible, and she gets to date a man who really loves her. What makes this ending work is that the problems were carefully revealed throughout the film and that we cared about Penelope. Our emotional connection to the main character made us want her to have a happy ending. Resolved, negative: in this story ending, all the problems are resolved, but the protagonists find themselves worse off. Hamlet is a good example, because Hamlet succeeds in revealing the corruption of the court and wreaking vengeance on his uncle, but he himself dies. What makes this ending work is the character’s conviction. If we as readers really believe in what the character is fighting for, we can’t help but appreciate their success even though they die. Similarly, this story might have the problems be revealed as solvable, but the character dies or is thwarted, with heart-breaking results. As long as the problem is revealed to have a solution, I think it’s safe to say the story is resolved. Unresolved A (stealth resolution): in this story line, we don’t see how the problems could actually be solved, but we have some solid ideas or certain hope that they will be. [The stealth resolution can have an unhappy variant: we have some solid ideas about how to solve the problem, but we can see the main character will never succeed.] For example, in Gone With the Wind, Scarlett is back at Tara and has just lost the man she spent years trying to pretend she didn’t love. But after all the plants and set-ups, the reader is pretty sure that if Scarlett sets her mind on getting him back, she will. The vast majority of “unresolved” endings are actually “stealth resolved.” There is a distinct satisfaction to this kind of ending, but it only works if the characters and the situations have been carefully painted and the reader feels like he or she can accurately predict their future. Another example might be Blade Runner, where many questions blossom at the end, but the main conflicts have worked themselves out, or The Giver, by Lois Lowry, where we don’t know if Jonas ever finds freedom, but we do know that he has made his choice to turn away from his community’s morality, thus resolving his painful internal conflict. In literary fiction, we often see the way people can have happy endings, but we know they will never achieve them, due their internal flaws. One example of this is The Pilgrim Hawk, by Glenway Wescott, where we know the couple who owned the hawk will never really sort out their marriage. Unresolved B (commentary of loose ends): in this story line, the problems are not actually solved and we either have no idea how they could be or have too many potential solutions. These stories are rare. A good example would probably be Mulholland Drive, a film that plays with dense layers of storyline and symbolism to create a puzzle. Just sorting out who is who is satisfying, let alone figuring out what everyone’s problem might be. In these stories, the ending is usually most pleasing when the story is a puzzle or when the lack of resolution reflects a philosophical outlook of a character or the author. The key to any ending is look at the way problems and conflicts are established within your story. If your problems come from a deep character flaw or a broken social situation, those problems may not be surmountable. In that case, it makes sense to end your story with an unresolved ending — probably Unresolved A, because you want the reader to be able to make a clear judgment about your character or that social situation. (And if you’re not sure whether you want your reader to make judgments about characters and social situations, let me give you hint: yes. It’s okay for those judgments to fall outside of the strict realm of black-and-white, good-and-bad, cardboard cut-outs, but well-rounded does not mean wishy-washy.) The wonderful thing about having a story revolve around an insurmountable problem is that it can add a sense of scope to your story. A lot of the greatest works of literature–think Of Mice and Men, 1984, Mrs. Dalloway–have endings where the problems do not go away at the end of the book, and the main characters are left in worse shape than they began (or, you know, dead). On the other hand, if your problems are surmountable, then the emotional resonance of your ending has to lie in the characters. If they can win in the end, we have to be able to root for them. Maybe they’re incredibly passionate about their cause. Maybe they’re really funny. Maybe they’re flawed in a way that we can’t help but identify with. Look at the film and novel About a Boy (by Nick Hornby). The main character is a rich, boring, bored ex-musician. His biggest concern is how to fill up each day until he dies, and if he did die, no one on Earth would really miss him. But the reader can’t help wanting him to change and become a better person–because he’s utterly self-aware that his life is hollow and he’s just wasting it away. He just doesn’t have any clue or incentive to do anything about it. And haven’t we all had those days, days where we can’t get off the couch, even though our eyes hurt and we’re really tired of watching reality tv, but what would even be the point of doing anything else? Don’t we totally understand? So when the story ends, and that main character has succeeded and is happy, it makes us happy. It’s like being a Northwesterner and seeing the Seahawks go to the Super Bowl: you can’t help but cheer a little. So ask yourself, when you’re putting those final edits into place and you’re just about to add that magical “####” at the bottom of your manuscript: why did I make this ending the way I did? Is my story a big puzzle and my ending one last tantalizing clue that will leave my reader asking deep questions about humanity? Or is my story the gripping tale of a woman fighting for her life, and my ending is the triumphant success–or perhaps a heart-breaking failure? And most importantly, what the heck does your ending tell the reader about the most important conflict in your story? If your story doesn’t help us understand the deepest and most central conflict in your story, than you’ve dropped the ball. You misfired. You didn’t stick your landing. 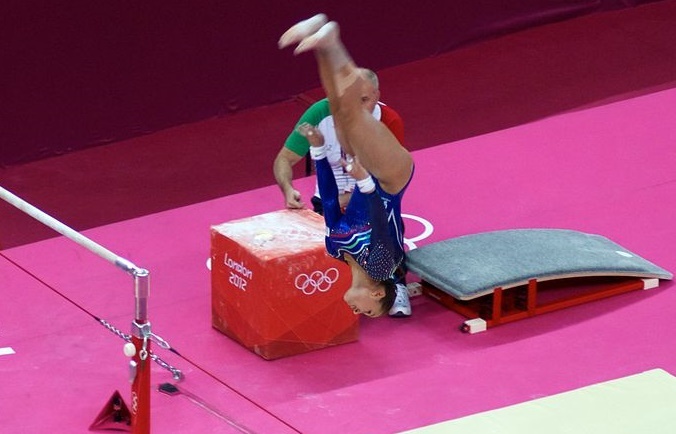 Every story — whether it’s a novel or a bit of flash fiction — is a gymnastics routine. Your characters and conflicts are the muscles in your legs that will launch you into backflips and twists. Your prose is your posture and the movements of your hands, the tiny lines in your joints and your fingers. You can get everything right, but if you don’t stick your landing, you won’t come home with the gold medal. So look carefully at your endings. Then go out there and nail ’em.